AnonD-12116, 10 May 2012Ur ar right Mr Ch.Saqib this is my idea.... Galaxy SIII is far beyond from normal 4n users... moreYou are right about the cores. Quad core. Are we really using a smartphone? AnonD-12116, 10 May 2012Ur ar right Mr Ch.Saqib this is my idea.... Galaxy SIII is far beyond from normal 4n users... moreYes. 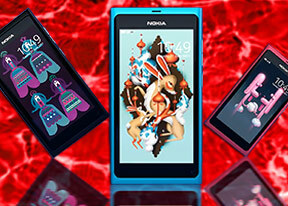 It is a perfect size and if watching any video clip the screen of N9 make you feel that you are using s bigger screen specially on black N9. If you want that much big screen then why not go for a tablet. Yes the apps are less but the most needed apps are here. Having more choice is good. What I miss the most is video calling and better Facebook notifications. Current notifications are not working very well. Don't forget the panorama. I've never seen such a result on any other device yet. Galaxy SIII is far beyond from normal 4n users,,. 4.8" display is too much daily routing of 4n users..
what is the point of having power hungry quad core processers ?do u going to play crysis 3 on it? So N9 is superior choice for normal 4n users ..
this is my feel...what i miss???? AnonD-12116, 10 May 2012hi guyzzz what do u think about camera between Galaxy SIII and Nokia N9(Both have 8mp)? ... moreFrom the specification they both look very similar. But less f number in N9 most probably give better result in low light. Carl ziess lens is also a positive thing in N9. I personally use wide angle and I like it more. Another thing which I have noticed is that N9 gives more real colours rather than enhanced. Most of the other camera phones enhance the colours. By comparing hardware specs vs. Price nokia is below others,even below d iphone. Nokia should go with their linux varient os,to make less costlier fones not with windows. Also their battery capacity is below 1500mAH even in their top end fons. what do u think about camera between Galaxy SIII and Nokia N9(Both have 8mp)? What is ur feel about this?what is best? Poor my N9.. now in progress to update my sgs2 to ICS.. singapore. AnonD-54027, 10 May 2012when you say this phone is the best phone are you comparing it to n95 . i cant share with my f... morenope, we are not comparing it to the n95 we are comparing with any present popular fones available in the market now!! :-/ u r not thinking straight, y dont u purchase a blackberry if u like to socialize with people or sharing your media and images with them, y chasing a smartfone which u dont deserve :-/ and yaa u can dual boot your n9 with android and i guess you will be able to find whatsapp on the market of the alpha version of nitdroid !! hi friends, for n9 smartcam app available at nokia store but how to smartcam app connect with pc, where is app for pc to connect smartcam in nokia 9N thanks. ALL N9 LOVERS PLEASE READ THIS..